The first place that I visited in Sabah was the Danum Valley Research Centre. It’s a world renowned scientific facility in the Yayasan Sabah Forest Management Area, on the edge of the 438 sq km Danum Valley Conservation Area, the largest area of relatively undisturbed lowland diptocarp forest remaining in Sabah, and one of the largest, most important and best protected expanses of lowland forest remaining in SE Asia. The Centre was set up in 1986 for the purpose of research, education, training and wilderness recreation. It is probably the leading rainforest research centre in the Old World tropics. Several overseas and local scientists as well as about 25 staff are resident at the Centre. The area has a unique status because previously there were no human settlements, with no hunting, logging or other human interference. 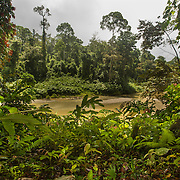 It is home to many birds and mammals including orang utans, gibbons, and other primates, tarsiers, deer, wild cats, sun bears and the rare Bornean pygmy elephant. The Sumatran rhino has also been sighted there. I was fortunate enough to have my first ever encounter with a wild orang-utan there. Other memorable encounters were finding a large tortoise and observing an otter fishing in a crystal-clear river at close quarters. The nocturnal forest sounds there were as loud as I’ve heard anywhere. The range and of sounds at different times of the night prompted me to start recording them. I stayed at the campground and every night I eagerly awaited the arrival of insects attracted by the lights, the most memorable being the giant cicadas that crashed around like a bull in a china shop. 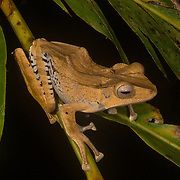 Night walks in the forest revealed a great diversity of arthropods, reptiles and amphibians. It was particularly good for spiders. 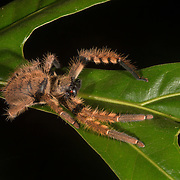 The arthropod fauna of Borneo’s lowland forests has been estimated at 3,000 species. Borneo may have more than 1,000 species of ants, with representatives of about 30% of ant genera and 7% of ant species globally.